Kastmaster style spoons have been around for decades. They flat out catch fish, whether in freshwater or saltwater. So we’d like to show you how to Build Your Own Kastmaster Style Fishing Spoons, and save some money in the process. 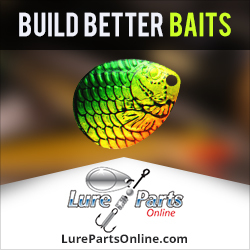 With these lures being made of solid steel, the prices have recently started climbing substantially. And, with these increases, this style of lure is no longer inexpensive to buy. But, there is good news! We’re going to show you how to Build Your Own Kastmaster Fishing Spoons for Cheap, saving you some of your hard-earned money for other things. You can learn to Build Your Own Kastmaster Fishing Spoons. It’s quite simple to do, since there are only a few components involved. The time it will take you to make one is minimal, at less than 5 minutes. We’ve listed all of the required components below, as well as a few accessories to make the task even easier. And the only tools you will need is a pair of good split ring pliers. You can see them here. Be sure that you know the front of the lure from the back, since they look pretty much the same at a quick glance. On these lures, the front is the skinnier end, and the rear is the fatter end. So be sure to attach your hook to the fat end. Select the size spoon you’d like to work with in order to get started. Then add a single treble hook to the tail split ring. If you don’t want any further customizations, you’re all done. But, if you prefer to build your lures to suit a particular species or a certain body of water, then feel free to use lure tape or lure dip to very quickly and easily customize the color of the bait. Sometimes the slightest variation in color can make the difference between getting bites or going home empty-handed. So don’t be afraid to experiment! The video below walks you through the steps to Build Your Own Kastmaster Style Fishing Spoons. So follow along, and then take your new spoons out and catch some fish! If you’d like to learn how to make a Chatterbait style bladed jig, click here. Special thanks to Spilt Milt Productions for creating this great video. This entry was posted in Lure Making and tagged Build Your Own Kastmaster Fishing Spoons for Cheap, Build Your Own Kastmaster Style Fishing Spoons, How to Build Your Own Kastmaster Style Fishing Spoons, Make Your Own Kastmaster Style Fishing Spoons on January 24, 2019 by Lure Parts Online.